When it comes to planning your ecommerce website, you may be overwhelmed with all the options in the marketplace. You want a professional looking website and online presence. Maybe you don’t want to invest in hiring a developer, or want an option you can easily maintain yourself. These ecommerce website builder options make website design a breeze. Are you ready to build your own website or create an online store? This guide is all about helping you understand what each different e-commerce website builder offers. The ten choices are distinct and unique from one another. The guide will help for you to look at each to see how well they might work for your online business. The theme refers to how the physical layout of a site looks. The layout should entail the ability to highlight different features on a site and to make it easier for customers to navigate. You will learn about how each service offers different themes that can be used, as well as how well you could adjust these features to suit your needs. Each review also has details on how easy it is to control the builder program. While you can use many themes from these builders, those themes are only starting points for how your site will look in the end. You will have to analyze how easy it is to use a particular site builder. You must review how well you can program a site, add features or plug-ins to it and arrange its physical layout in any way you see fit. An e-commerce site requires a variety of payment options. You will see in each review how to incorporate unique payment systems. These include traditional credit and debit cards plus mobile wallet and money transfer systems. More people than ever before are using their mobile devices for shopping online. 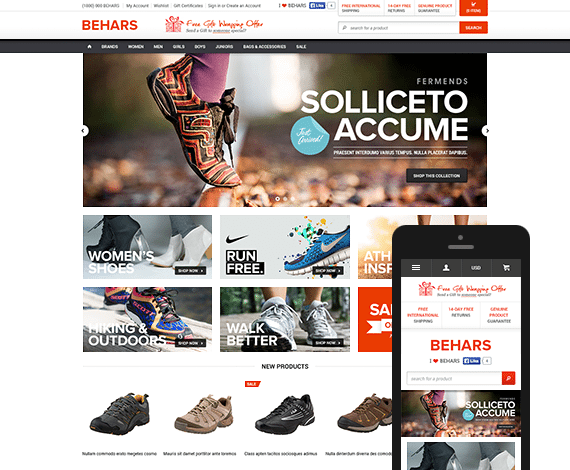 Each e-commerce site builder comes with its features for producing the best possible mobile versions of your website. Sometimes a program will automatically adjust the site while in other cases you will have more personal control over the process. These include added applications or systems that may help you with organizing how the mobile edition of your website may work. Depending on the provider, you might have to pay a series of transaction fees. Such expenses are charged based on how you sell products and the payment methods. There are various other aspects of each e-commerce site builder to look into. These points are just a few of the keys that you will learn more about as you read to find the best website builder for your ecommerce needs. Do not forget; a website is only the start of your online journey. If you need an SEO Expert, reach out to me anytime. Everyone has probably heard of Shopify.com. It is one of the most popular online eCommerce platforms and websites online today. Two of the “Sharks” from ABC’s “Shark Tank” show have recommended using Shopify for their online store setup. It has a number of robust features that attract online business owners, in addition to some natural tools and extras to help you maintain and market your site. In this post, we will take a look more in-depth into the popular online eCommerce platform and look at why it is so attractive to small business owners who wish to grow their brand online. Shopify comes with robust features that allow you to build more than just a website. You can quickly create an online eCommerce store, but you also have access to some other resources to build a blog or website that is both attractive and functional. One of the best things about Shopify is the variety of themes that are available. When you set up your business website, you need to know that you are using a template that will reflect your brand in the best way. Whether you operate a book club, a coffee shop, or a Fortune 500 company, you will find a theme that will fit your brand. Not all themes are free for use. Some of the high-end options that might make your site distinctive cost extra. One of the best assets of the Shopify interface and platform is the seamless UX that allows anyone to build a business website on his or her platform with minimal effort. You can go to the platform and start creating a site immediately without having to spend much extra time learning about the system or having to learn code or special tech skills. The menu for creating product listings has an extensive variety of categories. You can choose from several categories while also uploading images of your products onto each listing. You can select as many uploaded pictures as you want for each product. Shopify also has a system that lets you monitor customer information through a carefully organized database that links to your account. It saves information on customers, their purchases and much more. The data gives you a clear idea of what your customers want and how they choose to shop for items. It is straightforward to analyze buying behaviors. The system also uses a series of pre-engineered code features to help you add discount code boxes. There are many different eCommerce options out there to choose from. However, none seem to have half of the features that you will find on the Shopify platform. Below are some of the more robust features that you will find with Shopify. One reason so many people are using Shopify these days is that of the plugins that you will find on the Shopify website. These plugins allow you to promote content on your site that you would not have access to otherwise, thereby increasing your loyalty and engagement rate. Another Shopify feature that people like is the ability to utilize some different payment options. For example, you can use a variety of various technologies to process payments. Use Swipe, accept major credit cards, and keep all of your payments and orders in one place for easy reference. In addition to this, Shopify offers a way to increase your conversion rates and to use the tools that are already available on the site to recover lost sales from chargebacks. With this kind of devices to recoup lost deals, you can make a severe dent in the universe with your online eCommerce site. Shopify supports more than 70 payment platform; these include the PayPal, BitPay, Amazon Payments and Authorize.net systems. You need to make sure your eCommerce site is compatible with mobile devices these days. If you do not make sure your website is mobile-friendly, you will lose thousands of potential customers. Statistics show that the trends regarding mobile users will only increase over time. So it is the wise eCommerce owner who includes mobile support in their eCommerce business plan. Shopify allows you to easily integrate your site with mobile devices and users so that you will be able to appeal to mobile users as well as traditional desktop users. Do you need a way to keep up with data that you collect with your eCommerce site? Shopify allows you to collect data on customers and visitors without ever leaving the site. You will also have unlimited bandwidth, as well as product inventory, and customer data gathering that allows you to stay ahead of the game when it comes to customer and product research. As you can see, Shopify gets into the principles of good business, remarketing, and online data collection, as well as marketing and payment systems. In a way, Shopify seems to be the all-in-one solution that every online business owner can use to stay ahead of your business needs. Big data is one of the most critical aspects of online sales and eCommerce. If you are going to create strategic plans to follow customer behaviors, shape the outcome of product sales, and increase your ROI, it is important that you know how to use big data. Shopify seems to have the tools that you need to pull all of your data together in one place and operate your online eCommerce site from a higher plane that includes the information and data collection you need to run your business smoothly and efficiently. An additional great feature is that you can operate a multichannel and multiplatform business directly from the Shopify site. Shopify allows you to integrate all of your social media platforms and accounts within one place, right on the Shopify website. –Online store– The main reason that eCommerce business owners flock to the Shopify website to host their eCommerce store is due to its professional look and built-in high-tech payment system that allows anyone to sell with his or her website on the Shopify platform. Check out this feature and look at the different options you can choose when you sign up for an account, and you will get an idea of why people like it so much. You get everything you need on the Shopify website for setting up a professional store without having to use any other supplemental software. -Shopify POS- The Shopify system is more than just a website or eCommerce platform. They also provide a way for you to take payments “on the go” and from mobile devices and platforms. -Retail Package- a retail package is an option that is available on the Shopify site that allows you to integrate your online eCommerce Shopify site within your brick-and-mortar store. -Buy Button- The Buy Button is a unique way to create interest in specific products by embedding the offer into your web pages and blogs or social media. You will also be able to put the products on your website with matching colors and designs to fit your branding assets. -Pinterest Buyable Pins- This is a great new feature that allows Shopify owners to pin their products on Pinterest that will then automatically turn into a Buyable Pin. This will enable you to extend your product line to the Pinterest platform so that you can reach those that are on the Pinterest platform as well as your Shopify sites. This is made possible by the fact that Pinterest has recently partnered with Shopify to allow the integration of the two services. -Facebook Shop- You have probably heard about the Facebook shop. It allows you to set up a Facebook shop online through your Facebook account. However, now you will be able to integrate your Shopify store with your Facebook shop and pull in your products to display on Facebook from your Shopify store. This allows you to reach more people than you normally would be able to from Shopify alone. -Facebook Messenger- You probably have used Facebook Messenger on your phone or desktop. But with Shopify, you can tap into the power of Facebook Messenger through Shopify’s unique platform and even sell through the Facebook Messenger app. -Amazon- If you are a Shopify eCommerce business owner and you want to tap into the power of selling your products on the Amazon marketplace, you can do it now by using the Amazon integration of your Shopify products that you get on the Shopify platform. -Enterprise- With the Shopify Plus Enterprise option, you will unleash even more power of eCommerce on the Shopify platform. You can create a new product listing, launch a product, or integrate your products with many different channels such as Facebook, Amazon, Pinterest, and others that can help you expand your reach beyond the confines of your web server platform. Shopify has some of the best customer service representatives of any company online today. This is important when you have to deal with multiple different processes, vendors, customers, and systems. Most people report that Shopify has helped them out in times of need quickly so that they had minimal downtime from their problem. The transaction fees for Shopify vary according to the plan you choose. For Basic Shopify, you will pay a 2% transaction fee. For Shopify, you will pay only 1%. If you move up to the Advanced Shopify status, you will only pay a .5% transaction fee per transaction under the Shopify plan. Shopify has a wide variety of prices that you can choose from depending on the level of support, technology, and eCommerce tools that you want to have on your plan. For Basic Shopify, you will pay $29 per month. Shopify is $79 per month. Advanced Shopify is $299 per month, but it includes a variety of other premium services such as more robust customer service, a Shopify shipping discount, and more. A 10 percent discount is available for all annual plans. A 20 percent discount is included for two-year contracts. This makes Shopify an excellent choice for an ecommerce builder platform. Any eCommerce business owner who wants to find the best jack-of-all-trades platform to handle your online business site may want to consider looking into Shopify’s plan. No matter what plan you choose, you will find many reasons that it will help your business grow. It is easy-to-use interface, high-tech platform, and robust tools for social media and other sales platform integration are reasons enough to invest in this solution. Whether you are a small business just starting out or a well-established company, Shopify is a great all-in-one solution for anyone wanting to have their eCommerce services all in one place. It just might make things simpler. Check out the services and tools that Shopify offers you and see which so many eCommerce owners are jumping aboard Shopify for their eCommerce business solution. It may be one of the best business decisions you ever made. Check it out here at Shopify.com to see if it is a good solution for you and your brand. Volusion is a leading eCommerce platform that helps to facilitate the process of hosting your online storefront. If you are interested in launching your own store but you are unfamiliar with web hosting, eCommerce software, and managing a website on your own, Volusion offers a variety of solutions. Before choosing the right eCommerce platform for your business or brand, review the features and capabilities of Volusion to determine if the service is ideal for you. While Volusion offers designers the ability to get creative with their own unique layouts and designs, pre-made templates are also readily available for all customers of Volusion. Currently, Volusion offers 11 free pre-made templates to choose from in addition to a premium library of templates for an added fee. Most of the templates that are available from Volusion are also responsive, ideal for individuals browsing your website using tablets, smartphones, and other devices. Browse each template individually to compare your options before determining whether or not the style of the templates works with the layout you envision for your online store. Having the ability to customize your storefront’s theme to integrate it with your own branding is essential for success in competitive online markets. Volusion is ideal for both tech-savvy programmers as well as individuals who are not familiar with running and operating an online business. Whether you want to implement your own HTML/CSS-based template into your storefront or if you are interested in premade templates and further customization, Volusion offers solutions for any plan you have in mind. Use a traditional WYSIWYG (what you see is what you get) editor to manage pages along with a live editor for updates while viewing your website in real-time. Additionally, it is also possible to tweak and fully customize the existing templates Volusion has available. Using a real-time editor is a great feature for those who are not familiar with coding in HTML or CSS. Editing in real-time allows you to quickly add media, text, and other updates to your website within minutes. Without having to manage your web host, security updates, and potential issues you experience with a rented server, avoid feeling overwhelmed so you are able to maintain focus at all times. Using plug-ins with an eCommerce store is suitable to increase engagement while also improving your website’s overall ease-of-use for potential customers. With the right plug-ins, drastically add to the number of features your storefront has to offer to any visitors browsing your website. Currently, Volusion has a library of 61 add-ons available to easily integrate with your online storefront. Plug-ins range from traditional tools such as Constant Contact and MailChimp to ShipStation and eBridge Connections. If you are interested in developing your own API or connecting a current API of your own, Volusion also offers this capability to all customers. Even if you are launching a brand new eCommerce storefront, plug-ins help to boost subscribers and increase the number of page views your website receives. Creating an email subscription list or implementing automated shipping tracking helps streamline all of the data you collect from your visitors and customers. While Volusion itself does not currently charge a processing fee, the gateway of choice will on each individual sale you generate. Most processing fees range in the 2.4% area. However, Volusion offers a 2.15% processing fee option with a $30 flat monthly fee. Depending on the number of sales you average with your eCommerce store each month, Volusion’s own payment processing gateway may be an ideal solution. While most of the templates provided by Volusion are mobile-friendly and responsive, it is important to view all of the demos available before making a selection to ensure the layout of your choice appears properly with your mobile device. Not all of the templates Volusion has to offer are mobile-friendly at this time, which is frustrating for some customers and online entrepreneurs. However, payment gateways and completing the checkout process is entirely possible on all mobile devices, including both Android and iOS smartphones. If you are thinking of using Volusion as your eCommerce platform, be sure to test any custom layouts you have developed on various smartphone devices before launching your shop live. Phone, chat, and email support are available for all customers of Volusion (whether you have a premium package or not). It is possible to call Volusion directly at 1-800-646-3517 or by contacting them using email and the live chat service available on the official website. Support is available 24/7 for all customers, though individuals who currently subscribe to a premium plan receive expedited and “priority” service. There is also a complete knowledge base and a variety of guided tutorials available on Volusion’s official website to help new users become acquainted with the platform and interface. Watch views and access easy-to-read guides regarding each feature and function available when using the Volusion eCommerce builder. Currently, Volusion does not charge customers any transaction fees unless you are utilizing Volusion’s own monthly plan available (in exchange for a 2.15% charge on each purchase). Although it is not necessary to pay transaction fees when using Volusion, you are still required to select a plan or package that requires a monthly payment. Before choosing whether to go with a third-party payment processor or to stick with Volusion, consider your average monthly income compared to the overall cost of each. At the very minimum, it is important that your website generates at least $30 a month in revenue to cover the initial fee of Volusion’s payment processing service. Pricing varies drastically with Volusion to help fit any company’s business model and needs when it comes to building and expanding an online presence. For new prospective clients, a 14-day free trial is available to try out templates, test the storefront’s editor, and place your products online for others to view. The most popular plans available from Volusion range from $15 for the “Mini” package to $135 monthly for the premium package available. Choosing a plan that is right for you is best by first determining the budget you have available. Compare the amount of storage, bandwidth, and features available from each plan that Volusion has to offer. If you are interested in additional features or a dedicated account manager, consider opting for a premium package. Consider the type of integrations and features you want to showcase on your storefront, as well as the style of templates you are interested in using. Reviewing all of the plans at various prices can help you to choose a solution that works with your budget and is optimal for the current revenue you generate from your business. Volusion is an optimal solution for individuals who are looking to simplify the process of setting up a storefront and selling online. Eliminating the responsibility of hosting your own website, maintaining updates, and managing security help to improve your focus on other aspects of expanding your business. Whether you are an experienced programmer looking for an “all-in-one” solution or if you do not have programming knowledge but want to create an online presence, Volutions has a solution for all. If your goal is to improve your focus in all areas of managing an eCommerce business, using a hosting service such as Volusion is the right solution. With Volusion, spend less time publishing new updates and more time connecting with customers while growing your business and online presence. The next options for an online e-commerce website builder is Bookmark Website builder. This site offers a new opportunity that takes the design process into a whole new direction and for the better. Maybe you just want to build a website for free? They offer a free online ecommerce builder option. Bookmark focuses on being simple and easy to follow without having to use far too much outside help. Think of it as a simplified setup that is not too hard to work with and can certainly add a great design to your site that stands out well. Much of what makes Bookmark distinct is thanks to the site design assistant program that it uses. The AiDA program works by analyzing the business and industry functions that you might try to incorporate into your site. It can review the products you are trying to sell and the tone of your site as well. As AiDA analyzes these points, it uses an extensive algorithm to generate a proper design for your website. The algorithm will produce a site based on its tone and how visual your data might be. The layout can be altered over time but the details that the program gives you are often organized to be as thorough and carefully produced as possible. As unique as the design functions can be, you have the option to change everything you see after AiDA prepares a full display. You can use a simple drag and drop interface as needed although this might not be required when you consider how intuitive this setup is. You can sell up to 1,000 products on your site. Great web builder for beginners, drag drop editor. The shopping cart works on your domain without any outside setups required for making it run right. The information on your site can be quickly sent to eBay if you have a Business account. Business account members can also sell digital goods including access to certain platforms, subscriptions to individual items or the ability to download files. Discount coupons can be added and utilized on your site. These include coupons that work with promotional codes that are good based on a period of time that you have set up. Video backgrounds can be produced on the front page of your site to make it more dynamic and distinct. Add social media buttons to your site. Such icons let you share your information with more people on a variety of platforms. One appealing part of Bookmark is that all the features that come with the site are listed on the page. There is no need to have to download extra plugins to make them work. This feature is crucial as it ensures you will have everything you need on one site. You do not have to go around and download all sorts of outside programs just to make it work. Bookmark.com offers free hosting service, so your site will be up and running at all times. The setup is fully secured and ensures that your page will not experience any downtime. You can also have your original images and videos hosted for free. You can get them posted on your site to make it more illustrative and attractive in its overall style. Most major online payment programs are supported by Bookmark Website Builder. You can implement PayPal to work for you as well as other payment options. Stripe is also supported. Bookmark.com provides you with the freedom to take care of all kinds of transactions. Plans for working with such transactions especially does well when you consider how a variety of prominent online payment options work. You can also preview your site based on how it will look on mobile devices. The responsive setup of Bookmark.com’s designs makes it easy to quickly get a quality website up and running. The tech support features work by providing you with many bits of information that help you get more out of your website. The community forum, expert hotline, and email services are all useful for your needs. E-Learning courses include ones on how to start your own online business. Marketing points include search engine SEO tools and Facebook marketing solutions available for adding more ways to get the word out about your page. Social media concepts are introduced here as well. You will learn about how to integrate your website with a social media profile. Web design points including understanding how to make a site more usable and easier to navigate around work as well. Regular articles go on the site’s blog. These discuss trends relating to how to get a website running and what mistakes you need to avoid among other points. All the information provided on the site is detailed and will give you a clear idea of what you can get out of your e-commerce plans. Bookmark prides itself on being detailed and defined over what you can do with a site. Bookmark charges no transaction fees. It costs $14.99 per month to start up a Professional account. It includes unlimited storage and bandwidth and a free domain. Your setup also has advanced analytics and SEO functions to help you figure out how your site is being used. It also costs $29.99 per month for a Business account. It includes three email addresses, no transaction fees and the ability to support up to a thousand products on your site. There are no contracts required for services. You can still sign up for a yearly subscription to get a 20 percent discount on services though. Also, connect any domain that you already own to a Bookmark website to simplify the process of hosting your site. As you register, list any domains you have with the service to get them organized properly. The system works well if you are trying to move your site from one platform to the next. You might want to see how well the savings you get off of Bookmark are in comparison with what you can use elsewhere. Bookmark is ideal for a majority of people who are trying to start their retail sites. Bookmark has a sensible and a well laid out interface that is easy to work with and gives you more control over how you can sell things. It is impressive to see how well Bookmark.com can work as it offers a carefully generated website that is beautiful and appealing in its design. It can also do well if you want to sell digital goods. Wix is a website development site that has made it easy to design an ecommerce website for your business. You will not need any coding experience to create the perfect site on Wix. This guide will help you decide if Wix is the right tool to build your e-commerce site. Wix calls themes ‘templates’. You can choose from a variety of templates when you first set up your site. Wix organizes templates into categories to help you select the right one for your website. Wix templates use a lot of imagery. Many templates have space for large photos and graphics. If your business’s story is best told through images, Wix templates are a good choice. There are hundreds of different template options. All the templates are customizable — you can add your flair to your website. As you can see, Wixthemes cover many business sectors. Each category has unique templates. You will be able to find the perfect design for your e-commerce site. Wix updates their templates regularly. They make sure their designs develop as the web design industry develops. If you want a design platform that stays modern, Wix is a good choice. Unfortunately, you cannot change your template and keep the same website. Changing your template will mean building a new site. Make sure to choose the right template when you first start building your website. The best thing about Wix is how easy it is to use. You can ‘drag and drop’ items on your page to design your site. It’s perfect for people new to website building. Web design is complex. But using Wix takes all the hassle out of building a site. You no longer need to be a skilled coder or graphic designer to create a competitive ecommerce website. Gone are the days of using HTML to build generic websites. The Wix Website Editor has every tool you need to create a site from scratch. You can add links, photos, pages, and other features all with the click of a button. Wix allows users to design a site in the same way they would create a flyer. You are given a template, and you customize the contents. Changing color schemes, photos, page layout, and ad placement is easier than ever. You can create unlimited pages on your website; there is no need to restrict your content. WIX provides a platform that has endless possibilities. Plug-ins help you and your customer get the most out of your website. E-commerce site owners use plug-ins to improve what they offer their clients. ‘Online Store’ is Wix’s most popular plug-in for e-commerce. It’s a multi-component application that provides everything you need to run an e-commerce business. You can accept payments through their partnership with Ecwid – an online payment processor. Ecwid allows you to use PayPal, Stripe, and Square to process all your sales. You can categorize products and list them instantly. Your store can integrate into social networking sites and other online marketplaces. Online Store also integrates with shipping providers to ease your order shipment processes. From listing products online, to shipping them to customers, Online Store helps you streamline the entire process. This application is what makes WIX such a valuable e-commerce platform. If you have one of Wix’s premium plans, you will be able to accept online payments. Basic feature customers can also receive payments, but there is a $300 limit per month. As mentioned previously, Wix accepts payments through its ‘Online Store’ feature. One of the best components Online Store offers in integrated payments. You can use existing accounts from PayPal and Stripe to process online sales. Also, you can sync your Square payment facility with your online store to better manage digital and physical sales. Integrated payments with a Wix e-commerce site are seamless. Not only does Wix support mobile websites, but it also has a tool specifically for mobile optimization. Many web development platforms convert your mobile site for you. But the platform allows you to design and customize the mobile versions yourself. Mobile browsing has never been more important for e-commerce websites. Consumers are more reliant than ever on their phones for shopping. Having a mobile online store is essential. You can customize your mobile site with the Wix, Website Editor. You do not have to adhere to the same layout as your desktop homepage. The mobile support options ensure your customers can easily navigate your site using their mobile browser. Even though Wix is easy to use, new technology can still cause problems. If you run into issues building or maintaining your site, you will want a support team that can solve them. Request a Call – You can request a support technician calls you about your problem. Calls will occur during business hours (Monday – Friday, 6 A.M. to 5 P.M. PST). Submit Support Ticket – You can submit a ticket online with details about your problem. A support technician will then help you resolve the issue. Wix tech support does not have some of the same features as other web development platforms. You are unable to call a representative directly – you must wait for a callback. Also, they do not have a chat help service. Regardless, their support technicians do a great job of fixing problems promptly. As mentioned previously, Wix uses third-party plug-ins to manage payments. You can choose which payment provider you want to work with. Wix takes no transaction fees from your e-commerce site. They operate on a zero-commission business model. As long as you pay your premium monthly fee, you will never have to pay commission on sales. Third-party providers – such as PayPal and Ecwid – charge separate transaction fees. You should consult with them about what fees you will need to pay. Wix’s commission-free sales model is useful for those who want flat-rate costs. Your monthly subscription is all that you will ever pay. The price you pay for Wix depends on the plan that you select. Anyone can use WIX for free if they are happy with the basic features. WIX gives basic users unlimited pages, hosting, mobile support, and 500 MB of internal storage. If you want more features, Wix has premium plans. You can upgrade to a host of different plans if you need more features. Basic users host Wix ads on their site for free. Premium plan users can host their own ads. We suggest upgrades for those who plan on running a serious e-commerce site. This plan connects your domain to your site. This plan requires you to host Wix ads, not your own. Having a unique domain is essential for professional online companies. This plan includes features that help run e-commerce sites. There are also other upgrades at other price points. The two we have mentioned are the best value for money. E-commerce owners should opt for the e-commerce upgrade. The included features help you get the most out of your e-commerce site. You can also pay to have your e-mail services run through your account. Wix uses G Suite by Google to host their mail services. You can link your personal business e-mail to your domain name. I did a full detailed review of WIX SEO, check it out. Wix is perfect for e-commerce owners who do not have experience building websites. The drag and drop design platform allows anyone to design a professional online store. Business owners who want to take the hassle out of integrating payments systems will also benefit from Wix. Their online store plug-in provides all the tools you need to seamlessly conduct business online. It is also perfect for e-commerce owners who operate physical locations. You can run payments through your website and physical card processor at the same time. There’s no longer a need to use different processing platforms. Cost is not a problem – there are plans for any business’s budget. Small businesses can afford to have a world-class online presence with Wix. Don’t let your fear of complexity ruin your ability to run a successful e-commerce company. Squarespace is an online website building company that has been in operation since 2004. The New York-based site prides itself on offering a crisp and carefully organized layout that is very easy for people to use. The company provides sleek and elegant site designs for their clients. Our Squarespace guide will overview their e-commerce design platforms to help you decide if they are the right partner for your business. Squarespace provides themes in the form of ‘templates.’ Their templates are minimalist and sophisticated. But you can customize them in any way you want. Squarespace describes their templates as ‘starting points.’ They want you to add your ideas to the design of your website. Squarespace provides groupings for their templates. You are sure to find a grouping that fits your e-commerce industry. You do not have to choose a template that’s in your grouping. All of the templates are usable for any website. When you start a Squarespace site, you will choose a template. You will then add photos and other items to make it your own. There is further explanation of the design editing process below. Squarespace makes web design easy. They provide you with an intuitive design platform. You do not have to worry about any coding or technical problems. The website editor allows you to insert your text, images, and files wherever you want on your site. You can ‘drag and drop’ items to customize the design of your template. This removes the hours it would take make changes with coding languages. Recently, Squarespace has released LayoutEngine 2 – an update of their design platform. It makes creating your website even more straightforward. You can also design websites using touchscreen devices. One of the best features about Squarespace is ‘template changing.’ You can change your website’s template at any time. Everything you have put into your website will remain the same – only the template’s design will change. This is a breath of fresh air from other web design platforms. Many require you to rebuild sites entirely if you want to alter the theme of your website. Form-building is very easy to handle with Squarespace. It lets you choose from different points that you want to incorporate into a form and allows you to adjust how those features might appear in different parts. Squarespace e-commerce packages do not restrict growth on your website. With e-commerce packages, you receive unlimited storage and unlimited pages. You can build an online business of any size. Search Engine Optimization on Squarespace can also easily be accomplished. ‘Integrations’ are the Squarespace version of plug-ins. They provide additional capability to your website. Most good e-commerce sites use integrations to improve customer experience. Integrations can also help you understand your market and interact with customers. Squarespace has fewer plug-ins than some other online development companies. Regardless, they have enough integrations to help you improve your site. Various shipping service provider plug-ins are supported including the FedEx, UPS and USPS plug-ins. ShipStation prints shipping labels in bulk. AMP blogging plug-ins establish blog layouts. The Disqus commenting system allows people to interact with you in real time. Dozens of social media icons link peoples’ social accounts to yours. All the major social media sites have their own links as well as some smaller options. The MailChimp plug-in links an email database or system you are using and can even produce sign-up and newsletter blocks. Many integrations partner with third-party companies to improve your business. For example, you can integrate USPS into your website to streamline your shipping processes. Ecommerce owners opt to sync their social media platforms with their website. The social media integrations allow you seamless interaction between your social media accounts and website. Some external developers have created custom plug-ins for Squarespace. While some are very functional, Squarespace suggests you only use supported integrations. Squarespace has fewer payment integrations than some of their competitors. However, they still offer excellent solutions for e-commerce transactions. With Squarespace, you can accept payments via Stripe or PayPal. Stripe is a payment processor that accepts most major cards. They allow you to process credit card payments online with ease. They also support Apple Pay through their platform. PayPal is also accepted on Squarespace sites. You can use an existing PayPal account if you already have one for your business. PayPal is one of the most widely used commercial payment processors in the world. Many Squarespace clients use both PayPal and Stripe. This gives customers more options for how they want to handle their payments. Mobile capabilities are a necessity in modern web design. Shopping occurs more on mobile phones and tablets than computers in 2019. Squarespace has done a great job of providing mobile supported products. Squarespace templates have mobile templates built for mobile-friendly usage. You can view these templates on your web editor platform. These templates’ design is as responsive as possible to mobile browsers. Not only does this benefit your customers, but it also benefits your page ranking as well. Search engines highly value mobile responsiveness when ranking pages. Using a web development platform that doesn’t have mobile support is terrible for business. Regardless, if there is a reason you do not like the mobile layout on your phone, you can disable components of the mobile template. Technology can confuse you. If you are using Squarespace, chances are you are trying to make your life easier. That is why it is essential to have a great tech support team behind you if something goes wrong. There is a great ‘Help’ page that has information on every aspect of Squarespace. If you have a minor problem, you will most likely find a solution through this resource. Live Chat: You can live chat with tech support about any issue you have. You can do this as frequently as you want. This is available from 4 AM – 8 PM (EST) – Monday to Friday. E-Mail: You can e-mail tech support about any problems you have 24/7 – they will reply quickly to help you fix any issues. Squarespace collects a 2% commission on sales if you use one of their personal packages. If you sign up for an ‘Online Store’ package, you will not pay any commission. If you plan on making sales, it is definitely worth the upgrade. You will have to pay commission to Stripe – the card processing company used by Squarespace. They charge a fee for processing the payment from your customer. If you are conducting under $1m in sales per year, Stripe will cost you 2.9% plus 30c for every charge you process. PayPal will also charge you a processing fee. Those who make sales through PayPal will pay the same commission as Stripe for every transaction. Squarespace pricing depends on what you want from your site. Personal sites are much cheaper than business sites. Unfortunately, there are no free sites. If you do not want to pay before you try it, there is a free trial. You can try out everything Squarespace offers for 14-days. Better yet, you do not need to input any credit card details. You can save money with Squarespace by paying annually. For e-commerce sites, you have two choices: basic and advanced. We will explore each of these options below. This package is suitable for businesses just starting their e-commerce journey. It has what you need to create the perfect online store. You have everything you need to start an e-commerce site with this package. If you are starting your first store, this is a great option. For those who want more from their store, there is an advanced option. The advanced package includes the basic package features, plus more add-ons. It is great for owners who want to expand their e-commerce site. The advanced package provides more options compared to the basic package. Squarespace is great for beginners to web design. It provides the perfect platform for creating a professional e-commerce site. It gives you the tools to take your business to the next level. Squarespace is less affordable than some of its competitors. Regardless, it is good value for what it provides. You can save money by paying for subscriptions annually. If you have struggled to integrate payments and shipping into your business, Squarespace is a great solution. Their integrations take the complexity out of e-commerce. It is much cheaper than having a web designer build your site. It also means you do not need a support team on staff. In almost every way, Squarespace is much more convenient. Those who want to build a robust e-commerce site will benefit significantly from Squarespace’s tools. You will be able to create a professional and functional website on a tight budget. Jimdo is a Hamburg-based company that offers web hosting and site creation solutions. Over the years Jimdo has grown to work for a variety of websites. Today there are about 20 million websites online built through the support of Jimdo. The web builder is distinct and offers various ways for you to get your website up and running. But to make this work, you would have to look at how well you can handle the technical functions associated with a site. Although the layouts that Jimdo has to offer are relatively detailed and distinct, there are not all that many choices available. There are fewer than twenty arrangements for you to utilize here. These are organized based on the targeted organization you want to utilize on your site. Still, the lack of variety might be an issue to many users looking for a website builder. Also, you do have the right to change the color on your theme while also adding whatever images or other features you want to incorporate into your site. However, the changes that you can make to your template in the process are typically minimal. You will not be able to work with as many design changes as you might wish you could handle. Although it is not all that easy to alter the features of your theme with Jimdo, you will still have the ability to add extra features. The control panel lets you insert additional elements. You also have the option to adjust everything on your site. As you use the editor, you can prepare a new heading, add text, insert photos or videos and much more. You can even divide your text up into a series of columns or adjust the spacing features all around. You can also change the HTML and CSS codes on your site. Jimdo gives you the option to control those codes if you can handle them. The feature is for those who are a little more technically savvy when it comes to preparing websites. Jimdo supports a variety of widgets and plug-ins requiring a small learning curve. It has a full section that offers access to a range of plug-ins for your online commerce and multimedia needs. You might have to spend extra to get some of these plug-ins. Also, you would have to cut and paste the code from a plug-in into your site for the best results. Jimdo can support Stripe and PayPal payments. Just go to the Payment Options section of the Settings menu on your site to check on the particular payments you can use. The site uses many payment choices so be sure to think about the one that you know will work for your needs. Jimdo offers several customization options for getting a mobile site ready. Your desktop site may be adjusted in several forms to create a more distinct and visible setup that stands out well. The Mobile View option allows you to modify the mobile version of your site with a particular preset template. The setup has controls add and remove as many bits of data as you want as you are in the middle of that viewing option. But you will have to check on how well the information is listed and that you can read it on a device. The preview feature on the Jimdo desktop site is not always accurate. You can get help from Jimdo through an email service. You can send a contact form to get a message sent out by email. You would have to specify the particular package you have or what function you are trying to use. The customer service team does best when it has a clear idea of whatever it is you are trying to take care of. Jimdo does not offer any phone support. Also, the timing for getting a response from Jimdo will vary based on how many questions the site has earned. Jimdo does not charge you anything for your transactions. But you will have to look at any transaction fees that each payment portal will utilize. You can get Jimdo to work for you for free if desired. Jimdo has a free basic platform, but that is not going to provide you with far too many features. You will have to pay for Jimdo’s services if you want to get the most out of it. Although you could use the service for free for as long as you want without any pressure to upgrade, your business efforts will not go anywhere unless you opt for a higher-tier platform. The JimdoPro platform is $7.50 per month. It gives you 5 GB of storage and a full analytical platform. The JimdoBusiness option is $20 per month. This gives you access to more control features and the ability to support online transactions. You are better off using the JimdoBusiness package if you want to sell things online. The JimdoPro package works if you wish to promote your work or if you have a physical business location that you are trying to advertise online. Jimdo is useful for most businesses although it is best for those who are not overly choosy when it comes to getting templates or layouts ready. The website builder is also best for people who understand the more technical aspects of running a site. The extended use of codes through the Jimdo setup make it a more detailed and distinct option for when you are trying to create your own page. BigCommerce was formed in Australia in 2009 and has quickly grown into a service that offers a large variety of e-commerce solutions. The website builder has grown thanks to its many major sponsors and financial backers. American Express is one of the biggest supporters that BigCommerce currently has. BigCommerce is popular for how it offers marketing tools to make it easier for anyone to promote a site. It is also noted for making top-quality sites that are detailed and offer a variety of visual flourishes that will be attractive to many users. Still, the cost to run a site on this platform can be high. Although BigCommerce does offer various templates, they will charge extra for you to use. Choose from seven free arrangements or from more than 70 paid layouts that might be a little more intuitive and useful. Each template listing shows you a look at how the site will appear on a desktop computer as well as how the layout is arranged on a mobile device. The design gives you a clear idea of what to expect out of your site on any platform. You would have to check on your site’s needs to get an idea of what you might need. The ones that you would pay for include more functions and controls. You could always consider getting free website templates and then hire a professional web designer to help tweak and alter the template to your liking. You would have to consider the cost of getting such a service to work through as it might end up costing the same as just buying a template depending on the needs you hold. BigCommerce is a very scalable option. You can add many products and services by using the control panel to create new pages or product listings. You can add images and videos to each page. However, the ways how those are displayed will vary based on the template you use. You can also create product variants if desired. Plus, your BigCommerce site can sync up with many social media accounts you hold or even any Amazon listings you have posted. You will sell your items on more sites well beyond just the main one you set up with BigCommerce. Just specify the particular sites you want to list your work on. Using this tool gives you the general ability to find numerous ideal plug-ins. Using more plug-ins makes your site more versatile. Make sure you check on what you are adding to your site so you can give yourself more control over the entire experience of using it. Also, some of these require you to make a certain payment so check carefully on what you are working with in such an instance. An SEO builder and editor analyze meta content and keywords. The search engine friendly SEO Tools are a nice feature. Titles and URLs are optimized to make your site user-friendly. A blogging platform with an RSS feed gives you more control over what you want to say to your visitors. Integrations with many email services set up email marketing campaigns. You will reach more people in as little time as possible. No need to write a line of code. Produce emails with full customization features in their bodies based on subscriber data and preferences. You do not have the ability to change the subject line though. Conversion features include faceted search functions and abandoned cart saver tools. The BigCommerce App Store has many plug-ins for you to order. These include free and paid options alike. From MailChimp integration to QuickBooks Online support, you can find plug-ins for everything your site needs. The apps are split by category with some of these sections involving marketing and merchandising among other points. A vast variety of integrated payments are supported on BigCommerce sites. The platform works with more than 40 payment options as well as more than 200 local payment methods that vary by country. You would have to get onto the App Store to download proper plug-ins to support Stripe, PayPal, Apple Pay or Amazon Pay systems among others. Most of those plug-ins should be free to use. Add any template offered by BigCommerce onto a mobile device. As you look for layouts, you will see how each one looks on a smaller screen. Previews help you to see how well different sites are produced and how adjustments can make some sites easier to read on mobile phones and other related devices. There are live chat and email services available as well as a 24-hour phone support line. There are no transaction fees for payment portals. But you will have to spend such fees for processing credit cards. All accounts on BigCommerce are subject to a 2.9 percent plus 30 cents processing fee on all credit card transactions. There are sales limits on most BigCommerce site. That is, you can only sell a certain amount of goods on your site in a twelve-month period. The total maximum that you can sell in a year will vary based on the membership program you have been enrolled with. The Standard plan at $29.95 per month is a starter option and has a limit of $50,000 in sales per year. The Plus plan at $79.95 per month includes an abandoned cart saver and a limit of $150,000 in transactions per year. The Pro plan goes for $249.95 per month and offers a product filtering option for your site and a dedicated SSL option from a third party. You can sell up to $400,000 in goods per year. Enterprise programs give you an unlimited amount of sales each year and added technical features. You would have to contact BigCommerce by phone for more details and to get a heavily technical program up. The cost to get a premium template can be very high. It can cost at least $150 to get a layout. Still, those paid organizations are more functional than the free ones. A 15-day free trial of the BigCommerce system is available to give you an idea of how it works. BigCommerce is useful for businesses of all sizes who are seeking a flexible ecommerce platform. It does well for brick and mortar retailers that want to establish an online presence. It is also appropriate for businesses in a variety of fields. However, this works better for those who have enough money to where they can afford to handle certain functions. The cost for BigCommerce is rather high and can be even greater if you try using a more intricate layout that requires you to pay extra to use it. GoDaddy has been a big name in the world of online domain registration over the years. It has been trusted by many people around the world and has become so prominent in the field that it has even advertised during the Super Bowl on numerous occasions. Today GoDaddy has expanded its services to include its e-commerce page builder. It makes it easy to create your own online eCommerce store. The GoCentral Online Store is a choice that lets you get your business website running quickly, but it is important to look at how you can produce something special. GoDaddy has more than 300 templates. You can select your layout choice based on the category, style, features, color and more. You can also look at how well the themes look on mobile devices when you preview them. A review is posted on the site of each template to help you see how they work in general. Each theme is designed with a professional appearance in mind while still allowing for plenty of customization. You would have to look at how you would use your site when figuring out the particular theme you wish to incorporate into your site. GoDaddy uses a simple arrangement to get a site set up efficiently. It uses a listing setup where individual products can be customized based on the descriptions you wish to add and the photos you want to include. GoDaddy has made the process of adding content relatively straightforward. You can have as many as 1,500 products on your site while adding up to ten images per item. The shipping and abandoned cart recovery features make it very easy for you to handle different transactions. You can use these to send reminders to customers who have left things in their purchase queues or to help with calculating shipping costs and other charges associated with a transaction. If anything, the GoDaddy system works in a way that is similar to what you might get off of WordPress. It offers a sensible arrangement to help you prepare a more streamlined site without being overly hard to use. GoDaddy does not have any plug-ins for its system. Everything needed for operating a site can be found on the site. All credit cards are supported by the integrated plug-in that GoDaddy uses for its sites. You can also work with PayPal and Apple Pay transactions if you have accounts with those. Still, you will have to pay extra in transaction fees regardless of the payment process involved. Information on those charges is included later in this section. The design structure of a GoDaddy site allows you to quickly view your page on a mobile device. Larger tablets and small smartphones alike are supported here. The Page Help tab on the left side of various sections on your page will especially help you throughout the process. It will produce a small menu that lists information on what you can do at any time. The on-site help feature works alongside other traditional tech support functions that you can use from GoDaddy. These include live chat and email features. You will have to spend 2.9 percent plus 30 cents on each transaction that you process. It costs $29.99 per month to use the GoDaddy system. The website does offer a one-month free trial with no credit card required. Also, this works best when you register a domain name with GoDaddy. The cost of registering a name will vary based on how unique it is or what the demand for it might be. It might cost only a few dollars a year, but you should still check with GoDaddy to see what the terms of a particular domain are. You would be better off with the GoDaddy Online Store system if you were running a smaller business that is looking to get off on the right track. The system does well for when you are aiming to get off the ground with regards to running a site, but some extra effort might be required for you to get the most out of it. 1ShoppingCart has grown in size in recent years to where around three million businesses are using it for their needs. The service has a prominent setup for helping you to get different products listed online quickly. The service provides you with detailed help on all sorts of functions relating to getting your site ready. You will have to watch for the fees that come with running a site with this platform in mind though. Web.com is responsible for running 1ShoppingCart. The domain is a popular name in online website production. Web.com works with mobile, e-commerce and WordPress site creation services alike. The 1ShoppingCart brand is the branding that it uses for getting different online business sites up and running. 1ShoppingCart especially prides itself on how it helps with selling various products. In addition to traditional products, it can also be used to sell services or subscriptions. 1Shopping Cart offers a good number of templates that you can incorporate into your design plans. These layouts include choices that are varied based on their physical features. The shapes and parameters of each theme cannot be adjusted in most cases. While you can adjust a few features here and there, the design points used on the layouts are typically the best features that you could add. Each product page uses many customization features in mind, thus giving you more control over your site. The layout includes multiple images that you can choose to display based on when a customer might choose certain options. You can also let your customers magnify any images they come across so they can get a clearer look at whatever it is you are promoting online. You can use the program to edit all kinds of products and contacts while also adjusting your email and marketing campaign. There is even an analytics section included in the setup. However, even with that in mind, the process of using the system is relatively outdated. The designs used for getting forms ready and for creating establishing among other things are ancient when compared with what other software programs use today. The form setup might work well if you are familiar with older ways of building a site. 1ShoppingCart does not offer any particular plug-ins that you could add to your site. But it does have marketing tools as you will see in the next section. Upsell tools package items together. Email marketing campaigns are sent out in bulk through the system. Order management tools analyze transactions that come into your site. Program bonus coupons and other offers and then send those to people who have bought things from you recently. The platform analyzes who has done business with you lately and delivers reminders and offers as needed. Social media advertising prompts are easy to prepare. After establishing them, send them out to people who have bought things from your site or have visited in recent time. Autoresponders link to email addresses which you specify. Enter in your message to send based on certain things people do on your site. 1ShoppingCart has dedicated specialists to help with some of the particular marketing functions you want to utilize. But to get those people to help you out, you would have to pay extra for their services. Those totals would vary based on how intensive the services might be. The analytics section of the control panel does give you information on how many people show up on your site, what products they look for and so forth. It also keeps tabs on how your transactions are running. The review space gives clear idea of what might be more popular. Link to one of more than 50 different payment processors with 1ShoppingCart. You can choose the individual payment systems you want to work with through the appropriate prompt on your account. The shopping cart program has been integrated into the site. The plug-in does not require any added outside materials for it to work. Each site that you produce through 1ShoppingCart works on portable devices. The responsive design for each 1ShoppingCart site resizes and shapes individual sections based on the size of the viewing screen one is trying to read a site on. A series of full video tutorials are on the 1ShoppingCart website. This offer visual descriptions and displays on how to use the program. These videos are for those who do not have much technical knowledge in how to run a site. Contact the 24-hour email and phone support teams if you ever need extra help. The transaction charges will vary based on the plan you have. Regardless of the payment method, you would have to spend up to 1.25 percent on each transaction in fees. There are no ways how you can avoid those transaction fees either. The Plus program is $59 per month and uses a 1.25 percent transaction fee. You can only get one user license too. The Premium plan is for $119 a month and includes an affiliate management system that allows you to hire outside partners to help you market your products. It also has a 1 percent transaction fee plus five user licenses. The Ultimate plan at $249 a month includes all the Premium features plus a free domain name and a custom SSL certificate. The transaction fee is only 0.75 percent. 1ShoppingCart works best for those who want an e-commerce site that is not overly technical or otherwise complicated in its layout. The service is especially useful for smaller businesses that are trying to find a way into the e-commerce world. People who have extensive marketing needs may also benefit from what it offers. Weebly Website Builder places an emphasis on the drag-and-drop process for producing a website. The San Francisco-based company holds an extensive amount of experience, what with it having been in the field since 2006. Weebly ecommerce offers an extended number of quality services to give your site the support it demands. The themes here feature a more modern approach to creating a quality website that stands out. These are organized well and can add a nice look although it is not all that easy to customize them after you sign up. The themes should be chosen carefully based on the particular things that you want to incorporate into your site. You must think about the products you want to sell and the mood you will convey as it will be difficult to adjust the theme after you figure out which one you will be using. Weebly offers a full series of tutorials and menus to help you with getting your site set up. It takes a few minutes to get a site ready depending on the theme being utilized. You also have the option to add storefront or category pages that list specific points on each item you are selling. The page layouts offer a simple and easy to follow setup where you can organize your products by category or highlight the most important ones on your main page. The shopping cart functionality on the site lets you adjust the shopping cart functions to a variety of fields in mind and customize how they might appear. The site’s general arrangement is very straightforward. Depending on the particular membership program you are on, you can also get products from a CSV file or an Etsy or Shopify account linked to a Weebly page. Weebly will take care of the processing for you. Information on orders can be exported to a CSV file or a QuickBooks format. Again, this is for those who have higher-tier programs. Many added plug-ins are also supported. The Weebly App Center lets you find plug-ins for social media and marketing needs plus for communication standards. The tools are easy to use, but you will have to watch for the costs associated with some plug-ins. Not all of them are free. You can use the PayPal, Stripe, Authorize.net and Square payment systems. These allow you to accept credit cards and online wallet transactions. You can automatically connect your site to a Stripe account, but the other three require you to utilize a higher-level membership tier with Weebly. The mobile view function automatically works with smartphones and tablets and does not require all that much of an additional adjustment on your end to make it work. Weebly offers phone, email and chat support. The services are not available 24 hours a day though. The transaction charges will vary based on the checkout option you are using. Square, Stripe and PayPal transactions all have a cost of 2.9 percent plus 30 cents for each transaction. Authorize.net has a 2.4 percent plus 30 cents charge plus a setup fee. Also, a 3 percent Weebly transaction fee works on each order depending on the subscription tier you are on. The fee is used as a means of supporting the production and hosting options that Weebly offers. The Pro plan is $12 per month and lets you support an on-site checkout and up to 25 products for sale. The Business plan at $25 per month allows you use a checkout on your domain name and gives you unlimited products to sell. Digital goods and coupons can be added. You can even manage your inventory and calculate shipping and tax totals. The Performance plan at $38 per month offer all of these features plus no Weebly transaction fees (fees from payment portals may apply), gift card support and abandoned cart email support. Weebly does well for people who have basic business website needs although it is better for people who sell many versions of one particular product. The ability of Weebly to highlight many features on a site is an important point to see. Duda focuses on not only professional business sites but also on mobile sites. Duda places much of its work on producing a website that is easy to read on a mobile device. Duda is designed to be responsive site builder. It creates pages that are responsive without being complicated or too hard to use. The platform is easy to use, but is best suited for those who want to focus on mobile first sites. Seeing how so many people are using their mobile devices more than ever before, it is only sensible that you would want to use a service such as this. The layouts offered by Duda are divided by category. There are numerous choices for restaurants, travel sites, one-page sites, places promoting events and more. For online store use, the templates focus on one large image at the top and then a series of smaller ones at the bottom. The top margin can also support headings that lead to particular sections like a checkout page. Duda works as a drag-and-drop website editor. The layout uses a simple arrangement. It also includes a preview screen that shows how your site will look on all platforms. This section includes a review of what a desktop, tablet and smartphone version of your site will look like after that edition has been fully generated and prepared for display. You can also work with many languages. Duda works with many languages including ones that use non-Roman symbols. Your site can go three levels deep. It should be good enough for most web development projects. Also, you have the option to add a blog. It will add the RSS automatically. You will not be able to add comments outside of Facebook though. Add numerous images to your site as you see fit. You can add them to the control panel although you also may add free images. There’s the option to buy royalty free pictures, but you could always send your original ones to the site provided that you have full ownership of those shots. Add various widgets on your site. The Duda interface lists all the plug-ins you can incorporate into your site right on the main page. The layout lets you add and remove all sorts of items. Also, each widget is carefully designed to ensure that you can quickly get certain programs running online. There are no third-party plugins available from Duda. You are left to work with what Duda provides you. Duda supports Stripe, PayPal, and at least 30 other payment options. The site already offers many widgets needed for you to accept payments. Of course, some of these payment options are only useful in certain countries. You can utilize some offline payments through your Duda site. Secure wire transfer and cash on delivery services through your payment portal. Of course, you would have to ensure that you get the money you are asking for before you can get those payments set up. As you have already read, Duda certainly works wonders for mobile devices. The previews that come with the system make it easy for you to review how well your site will look and how you are going to get new bits of information and data added at any time. The support system run by Duda works with a full online database that lists information on what the company offers. It answers questions with regards to how to use a website maker among other key points. Live chat and phone services are also available. They are only good for 18 hours a day though. You will have to pay the transaction fees that whatever platform you plan on using charges. Such costs include a few percentage points of whatever you process. Be sure to check on such fees when getting help from the Duda system. The fees can be up to 3 percent in value depending on who you choose for your e-commerce payment collection needs. You can pay $14.25 per month for a basic business plan, or you can spend $295 for an extended contract that lasts forever. An e-commerce solution that offers support for 100 or more products is available for $22.50 per month. This also includes added support for more payment programs. The total is also based on a yearly subscription as you would have to commit to at least a year’s worth of using Duda to sign up. You will also have to pay extra to get your domain name added to your site. The site is hosted by Duda with the total value of the link varying based on what you choose to use. While Duda does have a detailed setup and plenty of options for payments, it is something that could still work for newer e-commerce users. It can be used for basic and advanced sites alike to create a layout arrangement that fits in perfectly with all kinds of demands. More importantly, this can work for those who might need to get proper mobile sites up and running. With Duda, there is a potential for you to set up a more detailed and intricate mobile site without being too hard to use. Each of the different e-commerce website builders that you have read about in this guide come with their particular features and functions. They are designed to be useful in their particular ways. Think about what you are selling and how you want your site to look based off of it. See how well you can control your site in any case. Check your plans for expanding your business. A builder should be able to grow with you. Look at your budget as well. You will not only have to pay for monthly access to a site but also extra for plug-ins and other features. Don’t forget about processing fees. By looking at these site builders, you will find that it is not all that tough for you to get a site running if you look at what you can get out of different programs. You will be amazed at the final product when it is all established right. Good luck with getting your e-commerce website up and running! What are you waiting for, build your website today? Did you learn something about the best ecommerce builders? Please do me a favor and share this on social media with the buttons below.